These days few hi-fi manufacturers want to be caught without an iPod dock or two in the catalogue. 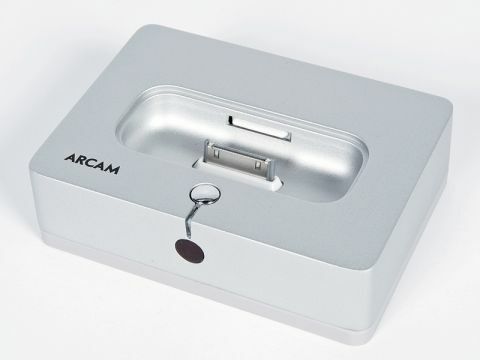 The Arcam irDock is one of a pair in Arcam's current range, both notionally part of the 'Solo' range and, as such, twinned with the Solo and Solo Mini all-in-one systems. There's absolutely no reason, however, to discount the possibility of using it on its own with any amp and speakers – and indeed TV or monitor, since it has video outputs. You can watch your favourite flick from a suitable iPod or just relay the cover art from the iPod's tiny screen. You do get slightly more integrated functionality by connecting to a Solo with the supplied RS232 cable, but as a standalone unit, with its little dedicated remote control, it does just fine. Arcam is pitching this product squarely at the high-quality end of the dock market, but as you'd hope at this price the construction is better than most too. The body is made of metal and that, plus the soft synthetic base, gives the unit a welcome degree of stability that's denied many cheap docks – some of them will be dragged off a shelf by the most modest pair of interconnects. Another thoughtful feature is the ability to turn off battery-charging while the unit is in use: Arcam claims that this improves sound quality (we didn't notice, admittedly) and also that it will improve battery life, a point well made since few batteries enjoy being charged excessively and battery replacement in an iPod is notoriously not for the faint-hearted. That apart, the functions are much the same as most docks. Output level is about 0.8V, well, below the typical CD player level of 2V, so you'll learn to advance your amp's volume control a little. After the initial surprise of finding just how good iPod sound can be, we've learned to listen out for the sort of differences that can exist between different docks. Typically these aren't vast, but the better ones give a shade more detail and transparency in the sound. On the whole we would rank this among the better ones. We do have some slight reservations, however, in two particular areas. First, the bass seems a little on the loose side compared with the best we've heard. Second, there's a little harshness at high levels. We were puzzled by the latter, not least because when we did some measurements to see if anything showed up we found distortion that didn't go away as the volume was decreased, even though the iPod's display was indicating lower volume. But, of course, the volume is actually attenuated in the dock, so it seems that the interface between iPod and dock is just slightly overloaded by full-level output. Unfortunately, with so many commercial releases mastered right up to 'peak bit', that's going to affect quite a lot of recordings. That apart, though, the sound is generally very fluid and natural-sounding, with very good detail in the treble and notably clear and communicative voices, both male and female. There's a nice sense of solidity to the lower midrange, which is mostly evident in bassy rock and similar stuff. Rhythm, as you might expect, is decent, rather than amazing, but it's still perfectly possible to find oneself indulging in a little involuntary foot-tapping now and then. Yet the irDock seems most at home with classical and jazz tracks, where its shortcomings are least intrusive. Here, it is precise and very persuasive all round.